I want to share more of his best printed work with you, Loyal (Constant) Reader. In compiling my selections for the next ten best Stephen King books, though, I must confess: this isn’t a “true” 11-20 list. One or two more deserving titles may have been omitted in favor of variety; on this diverse list you’ll find two more “Dark Tower” installments, a couple of collections, a sequel, a first-person testimonial, and a collaboration. Of course, everything is subjective. Happy reading! 11. The Dark Tower V: Wolves of the Calla (2003): It took six years for King to publish part five of his multi-volume “Dark Tower” saga after part four, “Wizard and Glass,” was published in 1997. For some Tower aficionados, that seemed like an eternity. For me, it was worth the wait. Book Five follows Roland Deschain of Mid-World and his ka-tet of Eddie, Susannah, Jake, and Oy to the cursed farming village of Calla Bryn Sturgis. The people of this dying town solicit the gunslingers to stop the fearsome Wolves of Thunderclap, who are forecast (by Andy the Robot; picture a malevolent C-3PO) to race into town and abduct one child from every family of twins (which, being a fantasy novel, is pretty much every family in town). “Ka is a wheel,” Roland says, and suspects that this ritual kidnapping is somehow connected to his own mission to find – and save – the Dark Tower. Also connected: Susannah’s insemination by a demon, and the multi-dimensional adventures of world-weary Father Callahan (of “‘Salem’s Lot” fame). Oh, how I love this tale! 12. Misery (1987): For almost the entire novel, Paul Sheldon and Annie Wilkes are the only characters. The book opens with novelist Paul coming out of a fugue; we quickly learn that he accidentally drove his car off of a snowy Colorado mountain road, and that his rescuer, Annie, is a) a nurse, b) his number one fan, and c) a homicidal maniac. Paul is the best-selling author of a series of Harlequin-esque, bodice-ripping, antebellum romance novels about a feisty heroine, Misery Chastain. Paul yearns to write “serious” fiction, however, and has killed off his creation at the conclusion of his latest novel. A livid Annie takes Misery’s literary passing a bit too seriously, and “forces” Paul to resurrect her in an exclusive novel written just for her. Annie locks him in his room, deprives him of the painkillers he needs…and woe be Paul should he get caught trying to escape. At a couple of points in the novel, Constant Readers turn the page and find themselves reading excerpts from Paul’s latest novel. These forgivable indulgences aside, “Misery” is a taut, funny, and scary metaphor for addiction – one of four (!) books published by King in 1987 and possibly the best of the lot. 13. Hearts in Atlantis (1999): This collection is something of an oddity: two novellas and three short stories, all of which are linked by one or more overlapping character. The book jacket description suggests that all five tales are related to the Vietnam War, although that’s really true about the second, third, and fourth stories in particular. “Low Men in Yellow Coats,” which opens the book, is the longest and most traditional-SK-feeling entry; it is about the friendship between young Bobby Garfield and old Ted Brautigan – a friendship that is innocent but haunted by fear, some of which is slightly supernatural in bent. “Low Men” was made into a decent film (called “Hearts in Atlantis”) in 2001. The next tale, “Hearts in Atlantis,” is one of the finest things SK has ever written. I try to read it once a year. In it, college freshman Pete Riley discovers the addictive power of the game of hearts, the allure of young love (with Bobby Garfield’s childhood squeeze), and the courage to protest an unpopular war. The third entry, “Blind Willie,” addresses survivor’s guilt, and is one of the more unique literary exercises in King’s canon. The fourth tale, “Why We’re in Vietnam” is talky and unusually political for the author. The final story, “Heavenly Shades of Night are Falling,” is only a few pages long and serves as a sort of chronological epilogue to the first story. Read this book. 14. The Shining (1977): I suppose every writer of horror novels must tackle the haunted house/manor/hotel at some point in his career. King got it out of the way early on with “The Shining,” which remains a fan favorite 38 years later. Writer and recovering alcoholic Jack Torrance takes a seasonal job as winter caretaker for the Overlook Hotel, perched high in the Colorado Rockies. He uproots his wife Wendy and their son Danny, who possess a sort of second sight that a friend calls “the shining.” As the snow piles up and isolates the Torrances, the hotel’s ghosts fill young Danny with fear and slowly drive Jack insane. Many horrifying images, such as a pair of menacing hedge lions that creep closer and closer to the hotel, were not present in the 1980 Stanley Kubrick-directed film adaptation, and those omissions, along with a different ending, irritated purist fans of the novel as well as SK himself. King produced a two-part 1997 TV mini-series that was more faithful to the book, and while I haven’t seen it, I’ve heard that it’s something of a dullard. The Kubrick film, ironically, is now considered a cinema classic. The book is a literary one, for sure. Remember: redrum. 15. Doctor Sleep (2013): It seems that I’m in the minority, but I think this sequel to “The Shining” is as good as the original novel. Over thirty years have passed since Jack Torrance blew up the Overlook Hotel, sacrificing his life in the process. His now-adult son, Danny, has grown up to be an alcoholic, same as dear old dad, and he rambles around New England. His clairvoyance is kept at bay courtesy of his drinking, and this semi-permanent fugue risks keeping him from able to “see” and help Abra, a young girl with an especially strong case of the shining. Abra’s “gift” makes her a target of the True Knot, a sect of vampires who crave not blood but “steam” – the psychic energy of children with Abra and Danny’s clairvoyance. There are some horrifying moments throughout “Doctor Sleep,” but much of the horror is implied in what would happen were the True Knot to succeed in their mission to capture, torture, and kill young Abra. 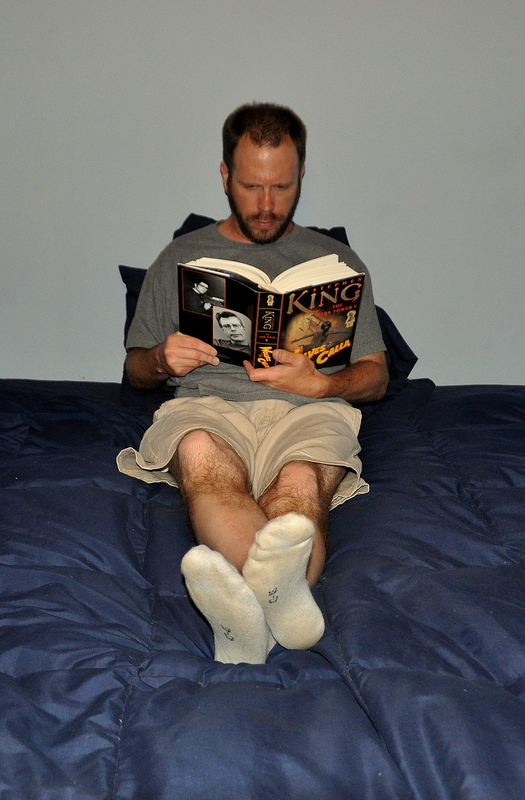 King is a father of three, and many of his most loyal Constant Readers have children as well. The subject matter is not off-putting, but gripping, can’t-put-down suspense. And if the final confrontation isn’t as epic as you might hope (it’s over awfully fast), know that the book’s post-battle epilogue is one of the best that SK has ever written. 16. The Dark Tower III: The Wastelands (1991): I loved the cliffhanger ending to this action-packed “Dark Tower” installment. Book Three in the series packs enough plot and action for 1,000 pages into its ~400, and is arguably the author’s tautest piece of writing. The story resumes after the “drawing” of Eddie Dean and Odetta Homes/Detta Walker. Eddie is now sober and the schizophrenic Odetta/Detta has merged into a new personality, the vibrant Susannah. She and Eddie have fallen in love and are turning into first-rate gunslingers. They join Roland of Gilead to free Jake Chambers, who was violently pushed from New York in the 1970’s to Mid-World before being betrayed by Roland in favor of the Dark Tower. A remorseful Roland is determined to do right by Jake this time, and he’ll have plenty of chances to do so as the group faces off against Shardik, Gasher, the Tick-Tock Man, and – in a cliffhanger ending that infuriated many readers but took brass balls by SK to pull off – Blaine the Mono. Although this isn’t quite my favorite book in the “DT” series, it is arguably the most ambitious, and it is the first to suggest the saga’s mammoth scope. 17. Night Shift (1978): I recently re-read King’s 2008 short story collection “Just After Sunset,” and although it contains some of the author’s most polished prose, the majority of the 13 stories between its front and back covers seem defanged from the dark, fast-paced morbidity that marks earlier SK collections. King’s first such book, “Night Shift,” was published in the late 70’s and contains roughly 30 dense tales that graced the pages of now-defunct men’s magazines like Cavalier and Dude. Each of these gruesome stories can be read in a single sitting; few are longer than 30 pages and many are no more than ten! Among the highlights: “The Mangler,” about a laundry press that needs a virgin’s blood in order to stop “mangling” its victims; “Battleground,” in which the childhood wonders from inside a toy chest come to deadly, destructive life; “Children of the Corn,” a disturbing tale about pagan religion that inspired a ridiculous series of B-movies, each one cheesier than the one before; and “The Lawnmower Man,” a goofy, surreal, what-was-SK-thinking curiosity about the lawn boy of your nightmares. 18. Under the Dome (2009): This five-pound novel is by no means SK’s best work. The ending is rushed (despite the book being 1,000+ pages), one important character is woefully underdeveloped, and another is a grotesque cliché. None of that really matters, however. Under the Dome succeeds as a half-pulp, half-Ray Bradbury political allegory about the new guard-vs.-old guard struggle for power. Life in the town of Chester’s Mill, Maine changes abruptly after an invisible dome mysteriously materializes out of nowhere to envelop the town. As planes and cars crash into the dome from the outside world while a corrupt car salesman with a bad ticker rises to power from within, everyone quickly becomes so determined to thrive or survive that they can barely find time to question why this dome appeared in the first place. Is it a message from God or is it something otherworldly? “Under the Dome” is the type of ambitious, flawed, fast-paced storytelling that – warts and all – the literary world can use more of. 19. The Talisman (1984): In the early 1980’s, just as SK was nearing his peak of popularity and of creative output, he collaborated with fellow horror novelist Peter Straub (“Ghost Story”), of whom King was a fan, for this fantasy-horror anthology. Twelve-year-old Arcadia Beach, NH resident Jack Sawyer’s mother is dying, and he sets out on a cross-country odyssey in search of a “talismanic” idol that he learns might save her life. Along the way, Jack finds the power to visit “the Territories,” a parallel world that is eerily similar to King’s “Dark Tower”-derived Mid-World. Naturally, someone else is after the talisman as well, although Jack finds help – of a sort – from Wolf, a slow-witted werewolf who is one of the authors’ most memorable characters. The book starts off slowly but is worth sticking with; the narration is vivid and Jack’s quest is moving. I once read that King and Straub wrote alternating chapters and then edited each other’s work. I for one can’t tell the difference – their consistency of voice is one of this novel’s best assets. The pair collaborated once again on a 2001 sequel, “Black House,” which also merits a read. 20. Dolores Claiborne (1993): Beginning with “Gerald’s Game,” SK went through a “women’s empowerment” period in the mid-1990’s during which he cranked out several novels about strong-willed women in unhappy marriages. Although this phase is not generally regarded as his high-water mark, the second book along this line, 1993’s “Dolores Claiborne,” is actually one of King’s most impressive accomplishments. The novel, told in first person narrative without a single chapter break, reads like a police confessional and is about tough, blue-collar widow and estranged mother Dolores Claiborne, who works as a caretaker on Maine’s Little Tall Island and is questioned by the police after her current employer turns up dead. The police think Dolores killed her, as she has long been suspected (but never convicted) of killing her abusive husband during a solar eclipse 30 years earlier. An interesting curiosity: the solar eclipse subplot featured into “Gerald’s Game” as well, as does a sort of telepathic vision, the only possible connection to the supernatural. Despite the lack of chapter breaks, this book is a fast read, with one of King’s most memorable characters in hard-working Dolores herself. How did I do? What are your favorite Stephen King books? Leave a comment below…and thanks!